It was a beautiful overcast for much of the day, complete with a juicy humidity. These days are few and far between in the land of Phoenicia and thus are much appreciated. I spent much of the afternoon painting a 30×40 canvas while watching “Caprice” on dvd. I can’t decide if I’m happy with it or if I still need to something. It looks somewhat empty…but then I like empty, modern paintings. I always hate when you see a nice mod painting, and the person has added on some sort of paper mache lettering or figurines to it. the Ouija board said she was going to die of colon cancer at age 46, and this was very traumatizing for me. I remember being so sad, and when we went to see Fletch Lives and then Beaches in the movie theater on the same day I was depressed for the duration of both films(Beaches especially obviously.) 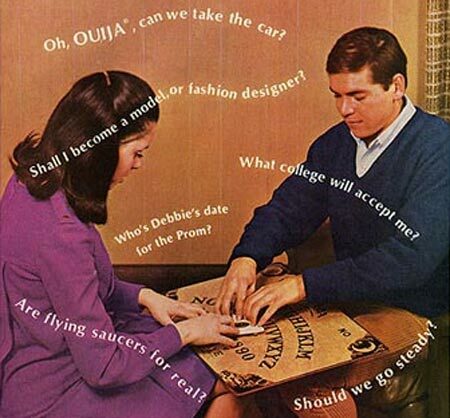 So we had these long Ouija board sessions, and I believed they were real. Years later my mom revealed me she had been moving it the whole time….which then led me to wonder why she would move it so as to have it say such horrific and emotionally distressing things to her young child…hmmm. Pretty creepy either way. Previous Article The other summer, in Arizona I was sentenced to the chair… They didn’t realize I knew the owner…of the power station there. Next Article The game was created to demonstrate the futility of individual effort.